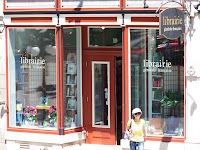 This is the bookstore where I purchased the books mentioned in the previous post. For some of you, access to this kind of resource is likely easy. Living in Calgary, Alberta, it is less so for me. Online access is, of course, an open door to all kinds of great resources but having a chance to browse through a shop in a French speaking community was deeply encouraging. I don't think the store has a website but I commend it to you if you ever have the chance to visit Quebec City.